0800h Deploy Launches – I’ll be on the 3101 this time! Tides for Sandy Hook High @ 0259 (3.7 ft.), 1532 (4.6 ft.); Low @ 0911h (1.3 ft.) & 2225h (1.5 ft.); currents in Sandy Hook Channel Flood: 0018h (1.0 kt. ), 1243h (1.7 kts. ); Ebb: 0648h (1.1 kts. ), 1937h (1.3 kts. ); weather from Sandy Hook to Fire Island AM: NE winds 15-20 kts., seas 5-8 ft., PM: E winds 10-15 kts., seas 5-8 feet. What a day! When I awoke it was apparent that the launches would be deployed on schedule (0800h). Once again the sky was gray, but the wind and sea was calm enough for us to get work done. After breakfast (oatmeal and Dramamine) we met in the Survey area for a safety brief. I was assigned to be on launch 3101 with Cox’n Pooser, Cox’n-in-Training “House” and Survey Tech Scott. Launch 3101 is only equipped with a MultiBeam Echo Sounder. We were the first to be deployed, and Bob Schwartz filmed the launch before joining the 3102 to continue his video work. Our morning on the 3101 began simple enough. Pooser was training House to drive the launch around the inner Sandy Hook harbor area. It was House’s first time on a NOAA launch, and, while he was quite eager to learn, the rough sea and his lack of experience showed. 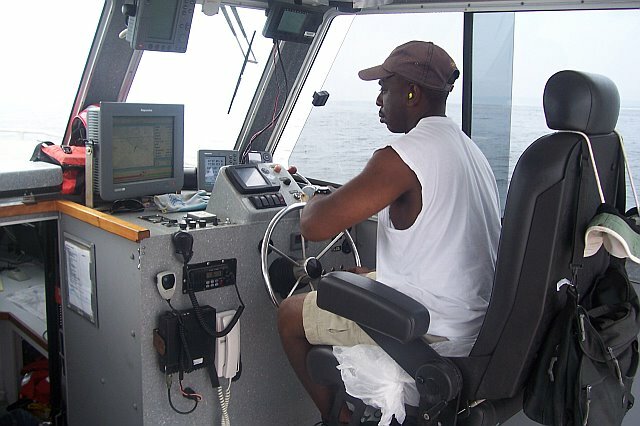 Pooser spent a long time instructing him on operating the launch and how to “drive lines” (that’s NOAA speak for keep the launch on the correct survey heading). Scott was all set up to gather data, but stayed very patient while House would attempt to drive a line and have to repeat the track because he veered off course. Scott and I joked that House was drawing a “double helix”. But House persisted and his skills soon improved. From the perspective of this novice, it was not a good sea for the first-timer. After about an hour of “drawing double helixes”, Pooser grabbed the wheel and began knocking off the lines like a veteran. It was about then that we first saw the FRB (Fast Rescue Boat) leave the THOMAS JEFFERSON on a mail run to the Sandy Hook Coast Guard Station. When the FRB got about half way to shore we noticed that it suddenly stopped in the water. We heard over the radio that their engine was smoking and she was dead in the water. Bummer! Since we were the nearest boat (about 300 yards away), we motored over and began the process of towing them back to the TJ. FOO Chris, Ensign Megan G., and Chief Buck were on the FRB, and they hung on as we slowly motored back to the TJ. We passed their lines to the crew on the ship and waited until we were told they were safe and secure. Then we were back to doing lines. After lunch the TJ called and asked us to go to the Sandy Hook Coast Guard Station and retrieve mail. The Sandy Hook Coast Guard Station is a nice facility with a great location. But the biggest thrill of all (for me at least) was setting foot on solid land! Yes, I thoroughly enjoyed our brief sojourn on land (about 15 minutes). (Now if only I could have a beer!!) We picked up two packages and, once again, went back to the 3101 and driving lines. We were surveying in shallow water close to the Coast Guard Station. Pooser really showed his skill driving the launch in these close conditions. This was a good learning experience for House. When in shallow water there is always a threat of running the expensive MBES into the seafloor. Pooser got as close as he could (only 7-8 feet deep! ), but reached a point where he had to tell Scott that we couldn’t get any nearer to land even though the plan called for it. Pooser suggested we return at high-high tide. There is no doubt about it, while the survey technician directs the data gathering, the Cox’n is in charge of the boat and everyone’s safety. We stayed out driving lines in the Sandy Hook area until 1730h. Most of the lines were short and taken as quality control (QC) checks for the existing data. When I spoke to Pete last night, he explained to me how there were questionable sections of the data, and additional QC lines were needed. Pete pointed out to me that these were usually areas on the grid where the Side Scan Sonar (SSS) and/or the MBES missed (e.g., the launch hit a wake and heaved a little too much). And it was Pete’s job to look over all the data and determine where these “holidays” were located. Another important part of our survey work is getting 200% coverage of the area. In short, the launches pass over the survey area twice, staggering their tracks to optimize the overlap. So, while it’s easy to see how well the launches contribute to the survey work, it is just as important (if not more so) to understand how all that data is checked and double-checked (and triple-checked!) before it is submitted as a report. When 1730h arrived, and it was time to return to the ship, Pooser let me take the wheel one last time. We went full throttle and reached 20 knots before arriving at the ‘TJ’. Pooser turned the wheel over to House and let him bring the 3101 to the vessel for a smooth retrieval. We cleaned the launch of our stuff, and were soon in the Mess Deck enjoying another meatloaf dinner. Once again, after a full day on the water, meatloaf never tasted so good! After dinner I called Roxann, went to the exercise room for a good 30 minute ride on the stationary bike, and checking on some more emails. As a final note, I’ve learned that there are two times of the day to optimize the ship’s dial-up internet connection: before 0900h and after 2000h. So, at 2000h I got on line and corresponded with a few folks. I was tired and was in bed by 2130h. All in all, a good day full of new experiences. 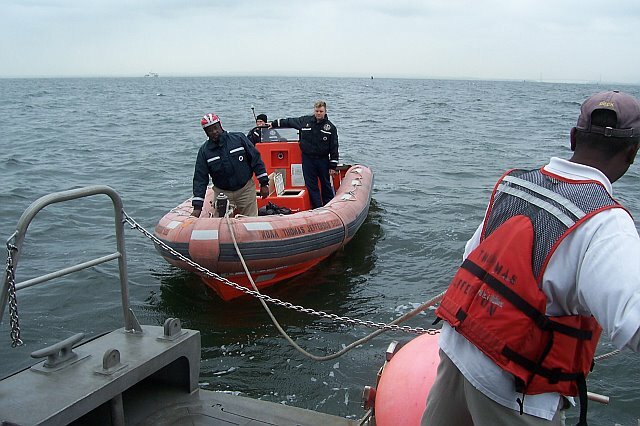 This entry was posted in 2007, Chuck Gregory, NOAA Ocean Service, NOAA Teacher at Sea and tagged echo sounder, Hydrographic survey, launch, multibeam sonar, new york harbor, NOAA Ship Thomas Jefferson, sandy hook. Bookmark the permalink.